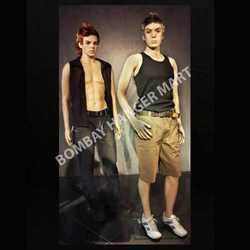 We manufacture and export a qualitative range of male mannequin, plastic male mannequin, which are extensively used in shops, malls, institutions and related establishments. Manufactured from the best quality material, these mannequins are highly acclaimed for light weight, natural flesh tone, scratch proof surface and excellent finishing features. Further, these can also be customized as per the size, material and other requirements of our clients. We provide our clients with a range of Plastic Male Mannequins, which are widely appreciated for their lightweight, excellent polish, natural flesh tone, durability and impeccable finish. Designed with precision, these realistic mannequins find application for display in retails, showrooms and shops. These can also be customized as per clients' specifications concerning material, size, shape and posture.